At Maplewood Laser Dental Clinic we offer a comprehensive solution for patients who have lost a significant number of their teeth. 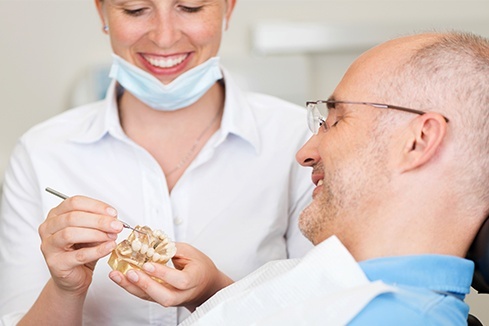 The all-on-4 procedure uses only four implants and a fixed, full-arch prosthesis to replace your teeth. This means we can restore the function and aesthetics of your mouth so you can smile, speak, and eat just like you always did. Instead of implanting a titanium root for every tooth, this procedure can replace between 12 and 14 teeth while only using four implants. This also means that the post-operative healing time will be significantly shorter, too. Each implant is placed in the anterior maxilla, where the bone density it higher, which means this is also a great option for people who may have experienced enough bone loss in the jaw area to make normal implants impossible. We want to restore your mouth to complete functionality as soon as possible, but it does take time for the bone to heal with the implants. So after the initial surgery, we will place some temporary teeth on the implants until the bone has healed enough to support the permanent prosthesis. If you need to replace several teeth, this is an effective option that allows for faster recovery. It is a permanent option that looks natural and can be brushed and cleaned just like your natural teeth. You don’t have to take them out, use adhesives, or give up some of your favorite foods. We will be able to restore your facial features, prevent further bone deterioration (which normally accompanies tooth loss), and give you a reason to start smiling again. Contact us to discover some of the benefits of an all-on-4 treatment so you can keep your overall health by eating well and preventing further decay and bone loss.